This post was a long time coming…..well some version of it. I’ve been thinking on this since Luis Cruz went all avenging warrior on us in the Mexico-Canadia game. It took the ugliness of the last week to make me put words on paper dealing with this subject. Brawls have no place in the MLB. There, I said it. I am tired of wincing when the benches clear and praying that our players don’t get hurt doing something stupid. I’m not going to lie. Some part of me deep down loves a good fight. The same part in high school that ran over to see two guys beat the crap out of each other while everyone chanted “FIGHT! FIGHT! FIGHT!”. But that’s the thing isn’t it? That part of me that is compelled to stare at such a spectacle has the mentality of a teenager. When the blood lust calms down and you look at it objectively, it really is silly. In the aftermath, nothing good is ever achieved by this. Up until a few days ago, the Dodgers have always walked away from such a melee with a few scratches and a bruised ego or two. Unfortunately, the Dodgers were not so lucky this time. Our 147 million dollar Dodger ace B is now the proud owner of a broken collar-bone, all because a Neanderthal ape of a man couldn’t control his rage at a slight that was all in his head. Again, nothing good was achieved by this. In fact, a whole lot of bad has developed. Not only did we lose Greinke for at least 2 months, but Jerry Hairston is now suspended for a game. Matt Kemp came very close to doing something very stupid in the parking lot, which would have led to a suspension, if not something worse. And best of all, we now have Dodger fans calling for blood, demanding that Kershaw or Billz drill the Padres in retaliation, as if that will make Zack’s bones heal faster. Don’t get me wrong, I was howlin’ mad when that ogre plowed into Greinke. I understand your anger, frustration, and the feeling of helplessness. But you think losing ANOTHER key pitcher to a suspension after we lost Greinke is going to help us? I thought the point of all this was to win the World Series. So I humbly offer this for your consideration. Instead of ‘getting back at them’ for what they did, how about we just beat them on the field? Instead of hitting their players how about we hit their pitches? How about if we win for Zack? I am sure Greinke would appreciate a stack of wins in his honor better than a stack of injured bodies. When he comes back in June (as I hope he will), wouldn’t he be happier if we are leading the division, setting the stage for his return and the boost he will bring? All this blood lust and talk of retaliation will lead to nothing positive. It will just perpetuate a cycle of ugliness that will just go on and on and perhaps result in loss of more players. Instead, just win for Zack! To my fellow Dodger fans, channel the anger you feel into your cheers for the team. That urge you feel to boo the Padres? Use it to let your team know you have their backs. Put an end to the negativity. It’s fitting that the first meeting between these two teams happens on Jackie Robinson day with everyone wearing 42. Think about the hell that Jackie had to endure, all without any form of physical or verbal retaliation. What happened last week was awful, but it was in no way near what Jackie dealt with. As AJ Ellis said, what’s done is done. Let it go. Rise above it. I hope the Dodgers honor Jackie’s memory by rising above the blood lust and calls for vengeance and just beat them on the field. Please keep doing this all season. Seriously, if he can continue to crush the ball like this during the season, things are gonna be a lot of fun! Last night against the Reds, the latest Dodger savior from the minors, Luis Cruz, smashed a double to left-center field off Johnny Cueto. James Loney on first base turned his speed up to 11 and motored around the bases to score the go ahead run. Unfortunately, 11 for Loney seems to be 3 for the average human being because he appeared to be chugging along in slow motion. The following GIF captures Clayton Kershaw’s reaction, verbalizing what we were all thinking. Preach on Clayton! Preach on! FEAR ME! FOR I AM BILL JAMES! 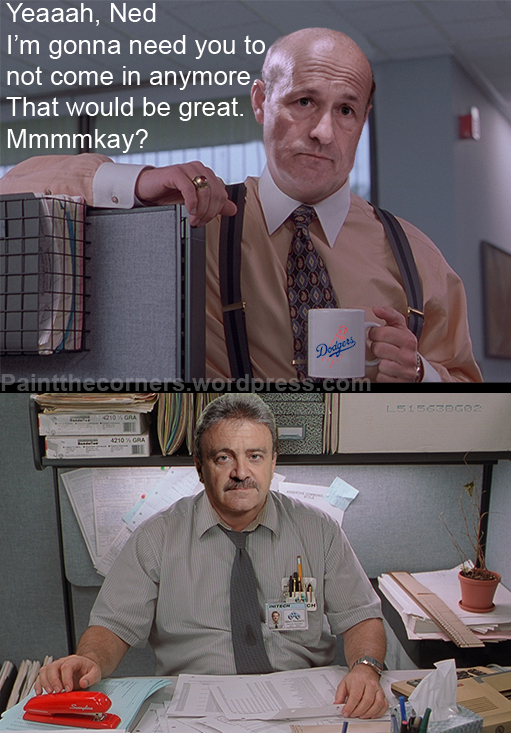 On the MSTI message boards, I’ve made several Simpsons based avatars for people with a Dodgers twist. So of course when a discussion turned to Bill James , I felt compelled to do one for him. Luckily I came across the Simpsonsized version that looked particularly creepy. The text followed. This makes me laugh every time I look at it. I imagine many “traditional” baseball fans look at James and see this. Its been a while since I have posted and I need to start ramping up. Hopefully, entertaining things will start happening that I can make fun of or make funny pictures out of, as material for this site. On a side note, I have several new designs that I will be showcasing here at some point in the near future. Gonna have to come up with some sort of voting system so that I can assess what designs people would actually want to see made into tshirts. But that is for another day. For today, I am starting off what I hope will be a regularly occurring thing here. #BOCHYFACE/#DONNIEFACE. In a previous post I detailed the two sides of the coin that are covered by #BOCHYFACE (when your team screws up horribly and forces the manager to make the Bruce Bochy face) and #DONNIEFACE (when despite a team that many say shouldn’t be getting it done IS getting it done….see 2012 Dodgers). Today’s installment focuses on the giants (of course) getting a severe #BOCHYFACE turning a one out rally into an inning ending sad face. Aubrey Huff broke up the no-hitter with a 1 out double in the bottom half of the 6th of the giants/Rangers game. That, brought up Gregor Blanco who hit a grounder to pitcher Robbie Ross. Ross threw to Adrian Beltre, who got Huff caught in a run down. When Huff was tagged out, Beltre fired a bullet to firstbaseman Mitch Moreland who tagged Blanco at first base (who really should never have strayed so far from first). #BOCHYFACE FOR EVERYONE!!! I made a GIF capture of the fun below. Enjoy your #BOCHYFACE giants, you’ve earned it! So there’s this guy in AAA that I think we should all take a look at. I hear he is getting called up tomorrow and wears number 27. AWWW YEAAAH BABY! The Return of the King! 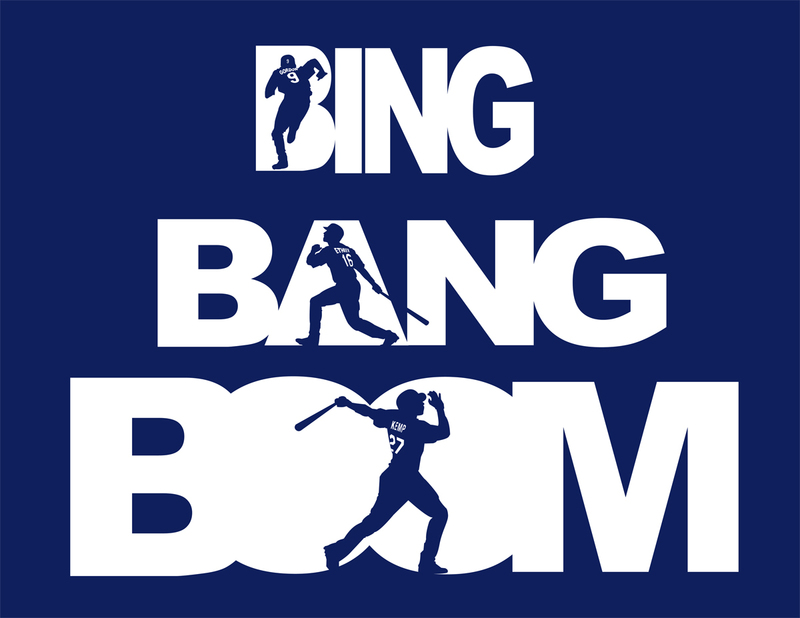 Matt Kemp comes back! And in honor of that I came up with this design. I’d like to make it into a shirt (or shirts) but unsure how I am gonna do it. Might be I do all three in one shirt or break them up into a series of shirts. What do you think? If I try to cram them all in, they may not be readily visible. Maybe a poster would be cool. And before people say “Why is Gordon on the BING?” I chose him because BING sounds like a little slappy kinda hit so I figured it fit. I thought of putting AJ in there since these three are the most productive hitters in the line up but would that be insulting to have him as BING? Lemme know your thoughts via twitter or in the comments.